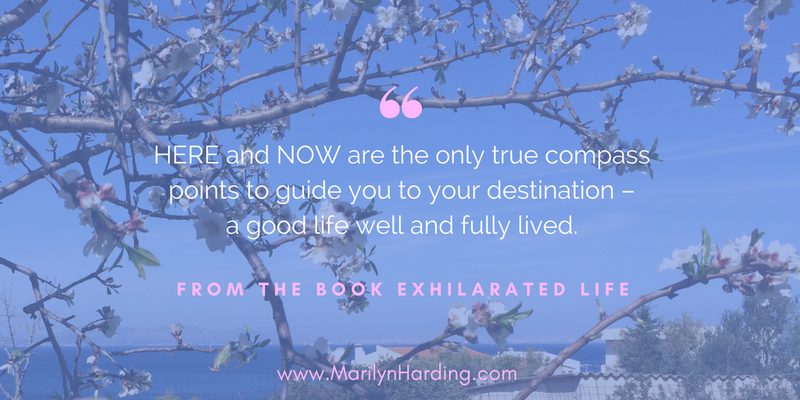 HERE and NOW are the Only Compass Points to Guide Your Life. A change of perspective will change your life and this is one of the most profound: Here and Now are the ONLY compass points to guide your life. If you take a moment and realise that both past and future are, in this moment, either memories or wishes, regrets or hopes you will come to the truth that they are nothing more than thoughts. Neither past nor future is tangible. Smoke. It helps also to realise that the past, as you recall it, is a filtered version of a an event based on your previous experience and vantage point. Someone else will have an entirely different recollection of the same event. What this means is that memories are subjective. You can even manipulate them into edited versions. The effect of the past will be based on your perception of the event, not the event itself. In other words, its hold on you is more about your hold on it. Similarly in respect of the future, you may have plans and dreams and goals, but they are not concrete, merely thoughts that will take form based on unknowable influences as they come to fruition or dissipate. Even as you think and dream, thoughts will shift and swirl randomly. Your goals may not even me your own, but a reflection of outside influence. What persists as a distant goal may not ever come to pass and may not even be what would fulfil you once attained. Here and now are where you are in action. Thoughts no longer without form, but coming into form with every decision make and action you take. You may be informed by the past and working toward an outcome in the future, but this moment is dynamic. This is where your life is lived. Here and now you can be nimble. Unfettered by past and unattached to future your moment is infused with the full power of creation; inspiration, intuition and synchronicity. Your destiny or life purpose now unfolds, not as future goals but as the fulfilment of your greatest potential in whatever form that takes. And you fulfil that every day of your life. Every moment. When you live this, you can be CEO, teacher, doctor, mother, poet, artist or banker and know that your life matters. This is the expression of joy and a good life well and fully lived. To the wonder of life!